We are located and operate in the Greater Kansas City Area. Send us a message with any questions you may have. We'd love to hear from you! "Spend more time wiggling your toes in it, than mowing it!" NEVER ANY HARSH CHEMICALS OR PESTICIDES USED. We use only natural and organic practices! 2012 is the worst drought since the Dust Bowl and all around is brown. Heat-stress & water-stress have taken a toll on the Midwest. In many places, only the weeds are surviving. It's time to start thinking about helping our lawns recover - and replacing weeds & bare spots that'll sprout weeds with healthy grass. Our Drought Recovery First Aid spray fertilizer application gives surviving plants a leg up to recovery... and our non-chemical soil amendment programs provides new seed with a healthy soil ecology to establish a more weather-resistant lawn. Experts warn that the drought cycle will continue through next year, so it's important now to preserve the soil & plant ecology that prevents the next Dust Bowl. Call us today for help with your little corner of the Earth! What are natural & organic practices? 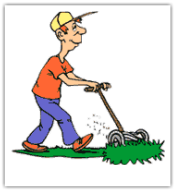 Natural lawn care in a nutshell Natural lawn care does not provide instant results. Think long-term (several years) instead of short-term care. "Keeping It Simple" is the best approach to natural lawn care. It does not require a large product inventory to maintain a lawn. Following best management practices while incorporating a few key lawn care products is all it takes. Let us help you enjoy your life all year round by starting at the base: the soil. It is where all the plants come from, and, let's face it, they do feed the rest of us.... if there were no plants how would we enjoy steaks, and chickens, and eggs, and cheese?!?!? Okay, so maybe they're not eating your lawn, but can you get the picture how everything is connected? The state of the union... from the Earth's perspective. A 2012 current event.